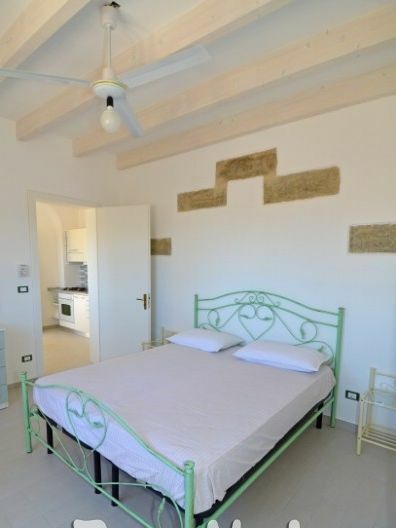 200 meters from the beach of Pescoluse, we rent a typical Salento house completely renovated this winter, with a beautiful Mediterranean garden of about 1500 square meters which it shares with another house. The beach of fine sand, among the most beautiful in Salento, is easily accessible on foot. 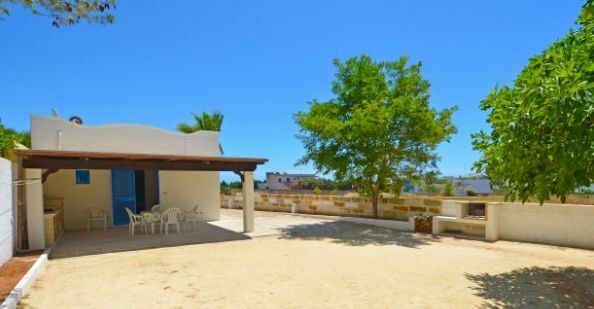 It has an entrance hall with kitchen, bathroom with shower, double bedroom and single bedroom, blinds, mosquito nets, ceiling beams and ceiling fans. TV and a large covered patio area with kitchenette and stone paving, outdoor shower with hot water, sink and barbecue and parking. 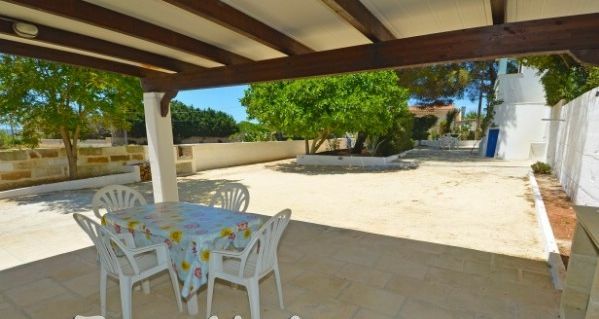 It is located in a quiet location but close to the beach. 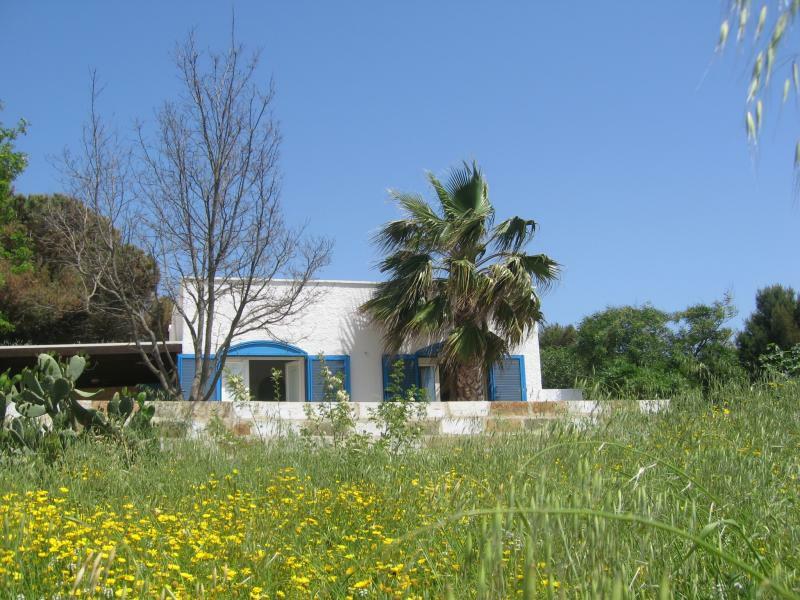 The house has a large garden and is situated in a quiet location 200 meters from the beach of Pescoluse (Municipality of Salve), 10 km from S. M. Leuca and 30 min from Gallipoli. The lively promenade of Torre Vado starts 500 meters away and provides a pleasant evening for those who have little desire to move. The grocery stores are all within walking distance. The hinterland, rich in historical centers, offers visitors many cultural events and festivals so they can fully experience Salento. Above all expectations, in a quiet, quiet location and 2 steps from a beautiful beach. Clean, tidy, spacious and with outdoor area equipped with sink, kitchen and barbecue, plus a very spacious garden, parking, drying room and outdoor shower. Air conditioning and ceiling fans. The only flaw, if you really want, the bidet is missing. We spent a week in true relaxation. Suitable for families with children, who can roam freely in the garden away from the road. Highly recommended, if we return here we will choose it again. Abitazione sopra le aspettative, in posizione tranquilla, silenziosa e a 2 passi da una bella spiaggia. Pulita, ordinata, spaziosa e con ambiente esterno attrezzato con lavello, cucina e barbecue, oltre a spaziosissimo giardino piantumato, parcheggio, stenditoio e doccia esterna. Aria condizionata e ventilatori a soffitto. Unica pecca, se proprio vogliamo, manca il bidè. Abbiamo passato una settimana in vero relax. Adatta a famiglie con bambini, che possono scorrazzare liberamente nel giardino lontano dalla strada. Consigliatissima, se torneremo da queste parti la sceglieremo nuovamente. CASE EQUIPPED WITH EVERY COMFORT. WONDERFUL LOCATION. RELAXING AND AWAY FROM NOISES. MAYBE TV A LITTLE BUT BUT FOR THE REST ABSOLUTELY TO RETURN. CASETTA DOTATA DI OGNI CONFORT. POSIZIONE STUPENDA. RILASSANTE E LONTANO DAI RUMORI. FORSE TV UN PO' PICCOLA MA PER IL RESTO ASSOLUTAMENTE DA TORNARE. We stayed for a week in this little villa in June. The photos correspond exactly as it is the house, the sea is close, 300 meters max and it is beautiful but if you go more towards Torre Pali is just the Maldives. I liked the fact that there was the kitchen both inside and outside, mosquito nets and climate. Great holiday home !! Exactly as by photo and description. The house, while not being air-conditioned, is fresh. The kitchen is very comfortable both inside (new) and outside. Improvable furnishings and outdoor shower (hot) should be made less visible from the street. 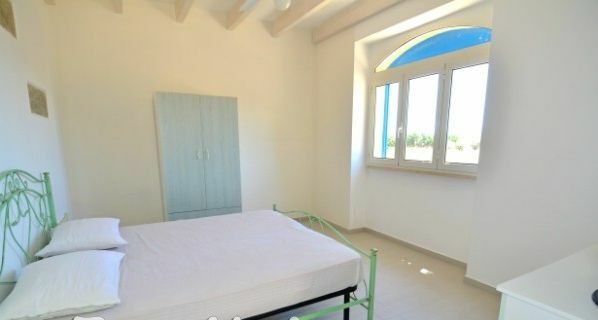 Within walking distance of a beautiful sea and beach. Returning to this area, I would definitely recharge this accommodation. Esattamente come da foto e descrizione. La casa, pur non essendo dotata di aria condizionata è fresca. 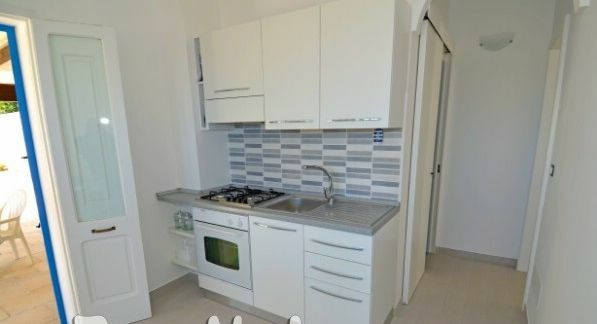 Molto comoda la doppia cucina sia interna (nuova) che esterna. Migliorabili gli arredi e la doccia esterna (calda) andrebbe resa meno visibile dalla strada. A pochi passi da un mare e una spiaggia splendidi. Tornando in questa zona, risceglierei senza dubbio questa sistemazione. The house is delightful and perfectly functional in all the services offered and fully responsive to what is shown in the ad. I would add only in the second bedroom a small closet because there is nothing to store linens. There is only one closet and dresser in one of the bedrooms. I recommend it highly. The owner was always helpful and attentive. La casa è deliziosa e perfettamente funzionale in tutti i servizi offerti e rispondente a pieno a quanto illustrato nell'annuncio. Aggiungerei solo nella seconda camera da letto un piccolo armadio perché non c'è niente per riporre la biancheria. C'è un solo armadio e comò in una delle camere da letto. La raccomando vivamente. Il proprietario è stato sempre disponibile e attento. I'm glad to know that you found yourself well, I had already budgeted the second cabinet and this winter I will. Mi fa piacere saper che vi siete trovati bene, avevo già messo in preventivo il secondo armadio e quest'inverno provvederò. 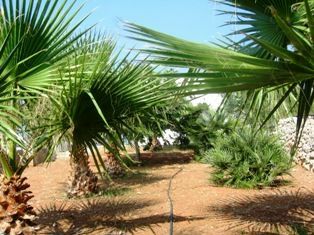 Near the sea, cool even during the hottest hours, outside garden well taken care of. Vicina al mare , fresca anche nelle ore più calde, giardino esterno ben curato. House very nice, functional and very close to the beach and boardwalk and surrounding holiday. 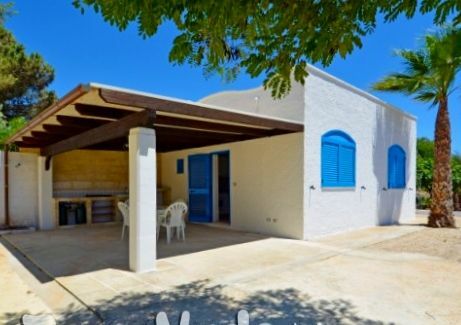 Casa molto carina, funzionale e vicinissima alla spiaggia e al lungomare, e fuori dal caos vacanziero. 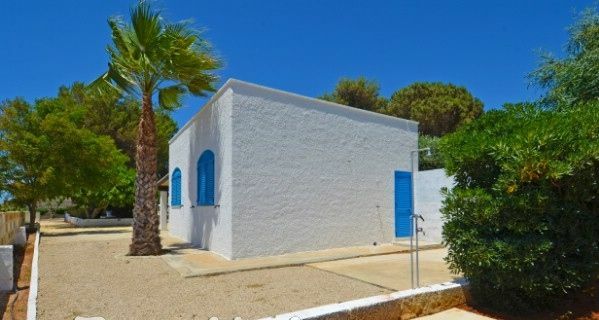 The house is in an excellent position, quiet and just a few minutes walk from the beautiful blue sea. It 'really nice, inside and out. The washing machine available to us was quite useful. If we get the chance we will be back for sure! 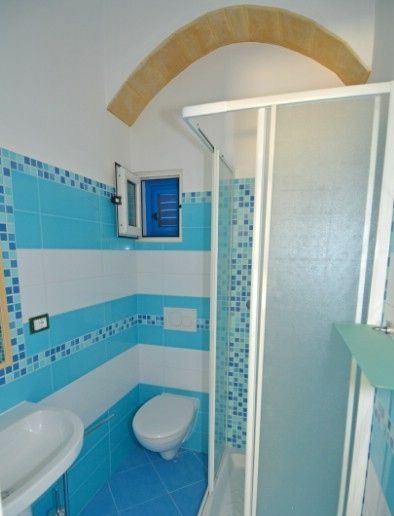 La casa si trova in ottima posizione, tranquilla e silenziosa e a pochi minuti a piedi da uno splendido mare. E' davvero carina, dentro e fuori. La lavatrice a disposizione ci è stata piuttosto utile. Se avremo la possibilità ci torneremo di sicuro! Very clean, well-equipped cottage. Unfortunately NO sea view - with any questions (only italian) the friendly staff of the landlord, Hr.Franco was always available and helpful. Walking distance to beach in 2 minutes, in the season naturally crowded, but all in all, highly recommended! Sehr sauberes, gut ausgestattetes Häuschen. Leider KEIN Meerblick - bei allfälligen Fragen (nur italienisch) war der freundliche Mitarbeiter des Vermieters, Hr.Franco immer erreichbar und hilfsbereit. Strand zu Fuß in 2 Minuten erreichbar, in der Saison naturgemäß überfüllt, jedoch alles in allem absolut empfehlenswert! Very convenient for its location close to the beach. Bella e confortevole casetta. Bello anche il contesto dove si trova, in luogo comunque tranquillo e riservato Molto comoda per la sua posizione vicinissima alla spiaggia. The climate september lets you enjoy the house: the porch is well used and the presence of shower (in the garden with lots of fig tree from which we could take every day! ), Kitchen and exterior of the appliance are a plus. The house has been recently renovated and the facilities are all fully functional. The area is quiet around not having public facilities and is 2 steps from the beach. I would fully positive experience. Il clima settembrino consente di godere appieno della casa: la veranda è ottimamente utilizzabile e la presenza di doccia (in giardino con tanto di fico da cui potevamo quotidianamente cogliere! ), cucina e lavatrice all'esterno sono un plus. 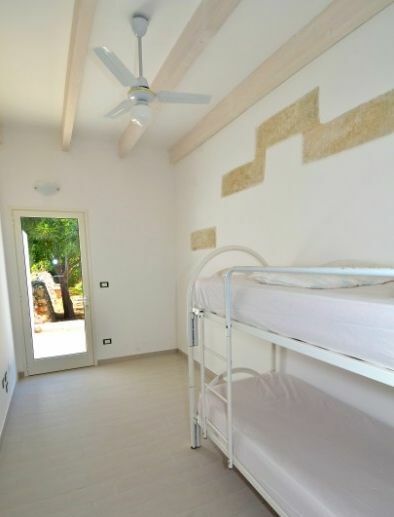 La casa è stata recentemente ristrutturata e gli impianti sono tutti perfettamente funzionanti. La zona è tranquilla non avendo intorno esercizi pubblici e si è a 2 passi dalla spiaggia. Direi esperienza pienamente positiva. 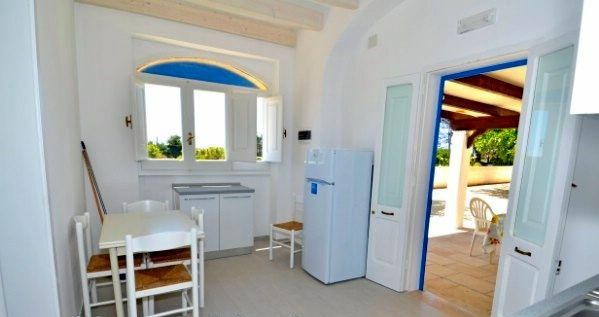 Casetta very beautiful and just completely renovated, with large covered terrace for outdoor dining. Quiet and secluded, and besides, there are double glazing so no noise at night. The beach and other amenities are easily reached on foot in a few minutes. Nice is the giardinettto with fig trees, if you are in the right season the fruit is already served! Casetta molto bella e appena rinnovata completamente, con ampia tettoia per mangiare all'aperto. Zona calma e appartata, oltretutto i vetri sono doppi quindi nessun rumore la notte. La spiaggia e altri servizi sono facilmente raggiungibile a piedi in pochi minuti. Accoglienza cordiale e disponibile. Simpatico il giardinettto con gli alberi di fico, se siete nella stagione giusta la frutta è già servita!